On Sunday, 6/1/2008, 16 members of Houston Chowhounds (HoustonCH) attended an 9+ course dinner at Feast, a new restaurant in the Montrose area which serves "rustic european fare." This was our first official HoustonCH event. I contacted the restaurant in advance and they agreed to serve us the 8 course tasting menu that they offer every Wednesday night for $40pp. I made plans directly with one of Feast's two chefs, Richard Knight, and also told him that we were a group of foodies so he had carte blanche to go 'crazy' with the menu which he was very excited about. Chef Knight greeted our huge table which was setup in their back room. He explained each course in great detail including preparation techniques and set the stage for the impressive dishes that followed. we were a happy and stuffed group leaving the restaurant. kudos to the chef and staff! the chef came back around for a Q&A with the table. it's just priceless being able to have open dialogue with the chef. the hospitality was warm and friendly, the service was smooth and efficient which is a hard thing to accomplish with a group this large. i know a few people took photos. anonymouseater's photos are already up on his blog. i'm hoping misha's will pop up on his blog soon. "the terrine was served with some sort of chutney. i thought it was tomato and onion based (i didn't taste fruit) but i'm not sure. i would have preferred something sweeter (like a quince jam) or something with bite (like a french country mustard) to balance all the fat in the terrine. that dish disappointed me the most as it sounded so fabulous. i am a big fan of all the components (sweetbreads, fois gras, & pork confit), but i didn't like what happened when it was all put together. it was just too fatty (words that rarely come out of my mouth) and the fois gras tasted like liver, which in my experience, never does unless you overcook it. " "i thought [the ruby trout] it was executed perfectly! 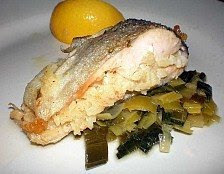 the saffron rice and the leeks sauteed in butter danced beautifully with the fish." "the cured pork liver, although not my favorite course of the meal, was actually one that i appreciated the most. as the chef described how the liver was cured, it was apparent that a whole lot of love and time that went into getting that dish onto our plates. i was genuinely impressed with what he did with 'carte blanche' and i loved being able to try something new. i agree that addition of fruit made the gummy textured liver more palatable. i did notice that 4 or 5 of us finished the whole plate." "the pork cheek salad croutons looked deceivingly like chunks of pork cheek. unfortunately, my plate arrived with only had one small piece of pork and 10 croutons. i was one of the last people served at my table, i think i got the end of the salad too, b/c my greens were overly dressed in balsamic vinegar.i agree. the terrine tasting was huge. i also understand that the terrine dish he used was traditional size (wide). a normal portion of terrine off the menu would have been sliced slightly thicker and easily serves 2-3 people. he sliced the terrine very thin for us, but in order of us to get a good cross-section of all the elements, we need a complete piece. 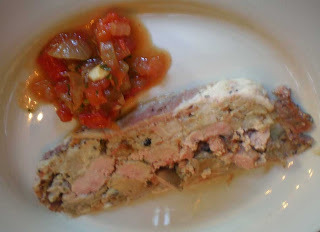 btw, there was a lot of fois gras in my piece of terrine. very generous!" Montrose is great restaurant. Our collage fair well was there. I still remember all fun we made there.